Attendees at Donald Trump’s presidential inauguration raised pitchforks and burning torches as Hillary Clinton was elevated above the crowds in a small cage. 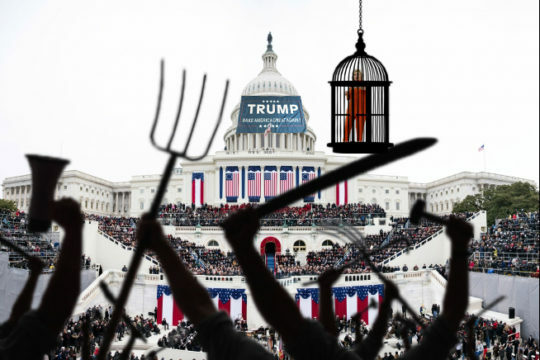 “I thought Hillary being winched into the air in a novelty sized bird cage was a really nice touch to the ceremonies program,” said one avid Trump supporter. Trump was sworn in as President Of The United States while placing his tiny left hand on a pocket-sized bible. “In the end we went for ‘The Bible In Colors Adult Coloring Book’, the Rosenman edition,” said Trump’s chief advisor. 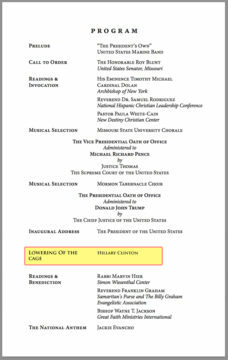 Trump gave a 140 characters or less inauguration speech before the scheduled “Lowering Of The Cage”. “Personally, I was disappointed it was a cage and not a guillotine,” said another Trump supporter holding a 5-foot long sickle.